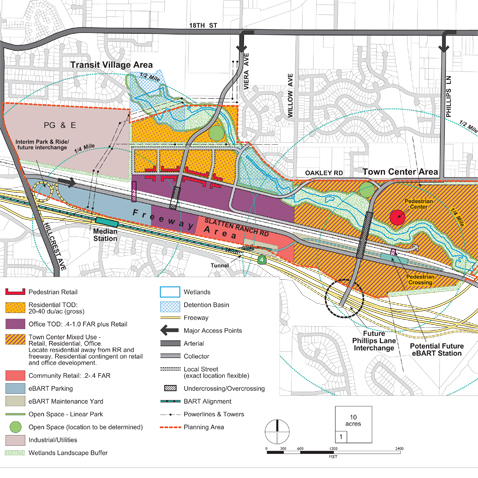 Dyett & Bhatia prepared a Specific Plan and EIR for area surrounding the future eBART train station in Antioch. eBART is the system that extends the BART system into eastern Contra Costa County. The City of Antioch’s goal is to create a multi-modal transit station and innovative transit-oriented development that fits into the suburban context. The City wants to ensure a range of employment, retail shopping, and services, as well as a variety of housing types. Numerous site constraints required an extensive, inclusive planning process. The area is divided by the rail line and major roadways, so pedestrian connections are challenging. There are endangered species and wetlands in the station area. Dyett & Bhatia worked with property owners, community leaders, and public agencies to develop a plan that is innovative and unique, and responds to the site constraints and the interests of multiple stakeholders. The Specific Plan was adopted in April 2009 and includes provisions for land use, density, streets, block layout, and open space network; illustrations for recommended building types, building to street relationships, street sections and streetscape design; as well as full implementation program covering phasing, financing, and infrastructure.